Here is a look at NJTL organization ACE, based in the Chicago area, where artist Justus Roe will make the public courts at Cooper Park his canvas starting on June 15. The ACE Project began in 2013 as an effort to provide out-of-school programs to under-resourced communities that lacked them. In doing so, the organization aimed to bridge the resulting achievement gap that sustained a cycle of poverty in these areas. What started with a tennis camp for elementary school students in Riverdale, Ill. – the site of the upcoming Art Courts project – has grown into a multi-city operation that provides free homework assistance, academic enrichment, nutritional support and social-emotional skill building. The program also provides resources that make it easy for parents and family members to engage youth both on and off the court. In the spring, The ACE Project ran a Serve & Connect program as part of a 2018 USTA initiative to build positive police-youth relationships through tennis. Every Friday for nine weeks, students at Roosevelt Elementary School in Dolton, Ill., interacted with local police officers through gymnasium tennis games and classroom discussions. ACE, an acronym for Active Children Excel, now operates both in the Chicago area and in Baltimore, Md. The organization expanded to Baltimore City following the death of Freddie Gray in 2015, and their first school site in the area was the elementary school that he graduated from, Matthew A. Henson Elementary. This month, The ACE Project will be given the gift of art from the USTA in conjunction with Chase, when four of their public courts at Cooper Park will be transformed into an immersive art experience by local artist and Chicago native Justus Roe. “It’s a dream come true for this organization,” said Susan Klumpner, co-founder and director of the ACE Project. Located next to several elementary schools that The ACE Project serves and across the street from the local park district headquarters, the courts are in a prime location in Riverdale. Klumpner is excited about how the artwork will enhance her program and tennis in the surrounding area. The ACE Project – Live! 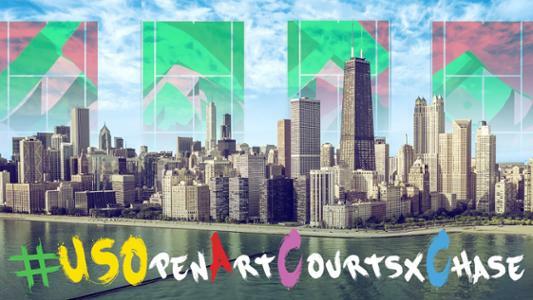 Join the 50th anniversary Art Courts celebration in Chicago, and watch LIVE on Facebook and Twitter, June 20 at 12 p.m. ET (11 a.m. CT), as we livestream the court transformation. Net Generation ambassador Jessica Popiol (@tennismessage on Instagram) will join youth from the ACE Project for a live painting session with artist Justus Roe. Connect with The ACE Project on their official website, Facebook and Twitter.